The man is in stable condition with a non-life threatening injury and apparently got stuck in the middle of a dispute between gang members, according to NBC 4. The incident occurred on the Metro 207 bus on Monday near 60th and Western Avenue. The suspect is at large; the Los Angeles Sheriff’s Department is looking at video footage taken by the bus’ video cameras. The bill cleared the state Senate late last week and would allow vehicles with one occupant to use the HOV lane on the 134 between NoHo and Pasadena and the HOV lanes on the 210 freeway between Pasadena and Glendora during non-rush hours. The bill by Assemblyman Mike Gatto basically allows Caltrans to run a test on both freeways and possibly others. Gov. Jerry Brown vetoed a similar bill in 2013. Things to listen to while sitting/standing/stuck on transit: Riders of a Certain Age — and hopefully those who are younger — may find Marc Maron’s interview with director/actor/writer Peter Bogdanovich as fascinating as I did. Bogdanovich made it big in the late 1960s and ’70s, back when studios were less risk-averse (although they probably still made a lot of crap) when it came to the type of movies they produced. 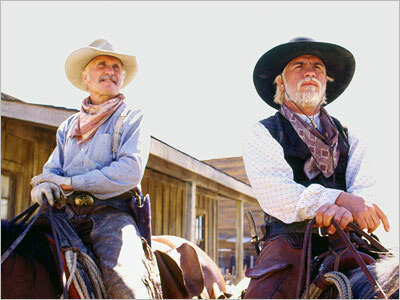 The former Texas Rangers Gus McCrae/Robert Duvall at left and William Call/Tommy Lee Jones at right. There are two anecdotes in the podcast that were news to me. The first is that Bogdanovich was in the early 1970s going to direct a screenplay by Larry McMurtry titled “Streets of Laredo” starring John Wayne and Jimmy Stewart. But Wayne backed out, thinking it wasn’t smart to be in a film that was basically an anti-western (perhaps Wayne forgot that he was earlier in “The Searchers”). The film wasn’t made, but McMurtry later rewrote the screenplay into a book titled “Lonesome Dove,” which btw is HWR’s Official Favorite Book of All Time. The mini-series of that book starred Robert Duvall and Tommy Lee Jones in the Gus and Call roles, respectively — casting that was pretty much perfect and better, I think, than Wayne as Call and Stewart as Augustus McCrae. New York: a city that ought to know about traffic! Photo by BK, via Flickr creative commons. The paper of record in San Francisco West takes a look at the city of Los Angeles mobility plan recently adopted by the City Council and Mayor. The City Council has approved a far-reaching transportation plan that would reshape the streetscape over the next 20 years, adding hundreds of miles of bicycle lanes, bus-only lanes and pedestrian safety features as part of an effort to nudge drivers out from behind the wheel. Not surprisingly, in the unofficial traffic congestion capital of the country, the plan has set off fears of apocalyptic gridlock. After moving west from New York, Gabrielle deBarros initially commuted to work on public transit. But she often found that walking two miles was faster than waiting for the bus. Now that she has a car, the addition of bus-only lanes will not change her habits, she said. As HRW has stated before, if bus lanes were easy to implement, there would be many miles of them in our region; it should be noted that although Metro runs bus service in many parts of L.A. County, Metro is dependent on the 88 cities and the county (in unincorporated areas) to install bus lanes. I still think bus lanes hold promise — and there are certainly many places where perhaps a parking lane could be converted to a bus lane without the world coming to an end. As for the “improvements in mass transit,” we’re working on it with five Metro Rail projects under construction and other projects underway or in the planning stages. 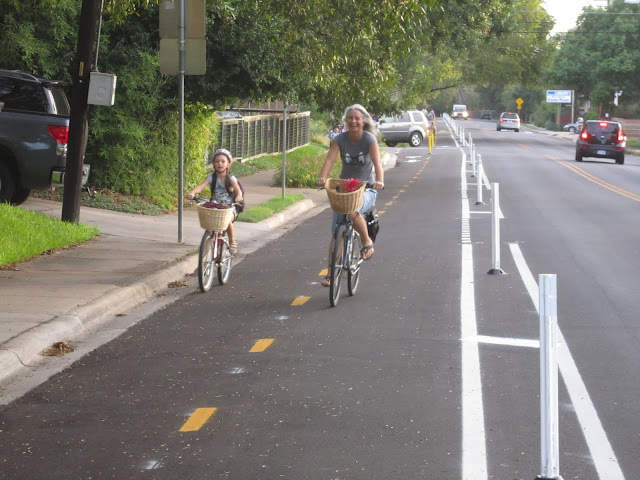 The city recently approved plans to add 30 more miles of protected bike lanes — i.e. lanes in which there is a buffer or barrier between car traffic and cyclists. Keep in mind this is a city in which the average high and low temperature, respectively, is 55 and 37 degrees. Of course, not everything is sunny in the Twin Cities. Some lanes are designed in ways that cyclists don’t favor and motorists continue to park in bike lanes in DTMI. Related: I simultaneously watched three different motorists use the bike lane along Main Street in SaMo as a pickup/dropoff lane (on the stretch between Ashland and Hill). That meant that cars were parked in the lane — one for almost five minutes — while cyclists had to veer into the street to get around them. •From the Dept of Ice Cream: HWR had the chance over the holiday weekend to drain his bank account and try the ice cream from two fancy ice cream purveyors — Salt & Straw in Larchmont Village (Metro Bus Line 14 along Beverly Boulevard) and Three Twins Ice Cream on Main Street in SaMo (Metro Bus Line 733 along Venice Blvd. and Main Street). Besides the silly high prices — $5 and up for a single scoop ice cream cone — I failed to see what the big deal was other than the fact that two ice cream shops had cleverly figured out how to separate yuppies/millennials/hipsters from their dollars. I sampled something called “apples and donuts” at Salt & Straw that tasted like Apple Jacks cereal. When I was eating Apple Jacks on a semi-regular basis 40 years ago, I don’t recall thinking “this needs to be ice cream.” HWR is sticking with Baskin-Robbins and the occasional pint of Graeters ice cream from the Ralphs on Huntington Boulevard (Metro Bus Lines 79/378). Bottom line: acquiring ice cream should not require a second mortgage. Thanks to all for thousands of Tweets about the status of TMQ. Am talking to 2 potential homes. Hope to have announcement soon. Hmmm…study the concept to open HOV lanes to all after commute hours? First time I experienced that was on Florida’s freeways 20 years ago–it worked then. But, better CYA and contract for a $40,000,000 study by CHM2H, like the 710 EIR. That maybe the plan, but what is the probability of changing the car scape to something like this instead? City leaders can assume car drivers will be driven out, doesn’t necessarily mean the only other choice is taking the bicycle or public transit. You can’t say for certain people will start changing their habits to scooters and motorcycles as an alternative either because it offers an alternative other than the car to go wherever you want to go when you want to go for cheaper cost of ownership than a car or enduring the poor quality of public transit where cuts to services, long waits, and fare hikes are the norm. Will never happen here you say? Guess again, it already is starting to happen. Next up, we’ll be having CicLAvia for motorcycle and scooter riders. Did you notice that the photo of the “transit etiquette” was taken in the 7th/Metro Station, and not at Union Station? That’s no accident. From my frequent observations at both of these stations I’ve found that the patrons at 7th/Metro Station are much better at observing this etiquette, while patrons at Union Station don’t seem to care whether their inconveniencing their fellow passengers. I have no explanation for this phenomenon, since the two stations serve approximately the same number of passengers (~70,000 per day). Also, Metro doesn’t seem interested in installing signage in either location. You can wait for government to do it or you can just go to any art supply store and make a sign poster yourself for less than ten bucks. Then again, I’m sure government will find a way to take it down once it’s up because of some dumb regulation or how it didn’t go through the “proper channels” to cost $500 to put up a sign. The reason the sign would likely be taken down isn’t dumb: it’s because if everyone put up their own signs, it would be confusing and may diminish a public space. Reminds me of when I was station master at a little Amtrak station up north. Amtrak provided NO advertising posters for local riders who were most of my customers. So given I have an art degree, I made up a smart looking poster in the station that told of sights to see along the line. Sold many tickets because of that sign…Then one day the Director of Advertising from Washington step off a train for a smoke and demanded that I remove the sign because it wasn’t official Amtrak issue…which I did of course..and so went my ticket sales with it. Due to too many comments unrelated to content in this post, the comments section for this post is now closed.